Research programs find themselves once again on the chopping block. Congress may continue to not care. Another year, another round of spending cuts; and, perhaps, another case of Congress riding to the rescue? The White House's budget request for the 2020 fiscal year, released today, once again seeks to scale back research programs across government, though most of the details will wait until next week. That's because the White House is issuing its annual proposal to Congress in phases, with only a 150-page budget overview released today. Ordinarily presidential budgets run thousands of detailed pages, but at the moment exact dollar amounts for most major science programs are unavailable (though some agencies like NASA and the Department of Defense are releasing additional info this week). Nevertheless, there's still plenty to digest, starting with recommended cuts to nondefense discretionary spending. Congress is coming off a two-year deal that raised the spending caps dramatically, resulting in some windfalls for R&D. But that deal expires in FY 2020, and current law requires the caps to ratchet down. That means a nine percent or $54 billion drop for nondefense discretionary spending this year, and an 11 percent or $71 billion drop for defense spending. 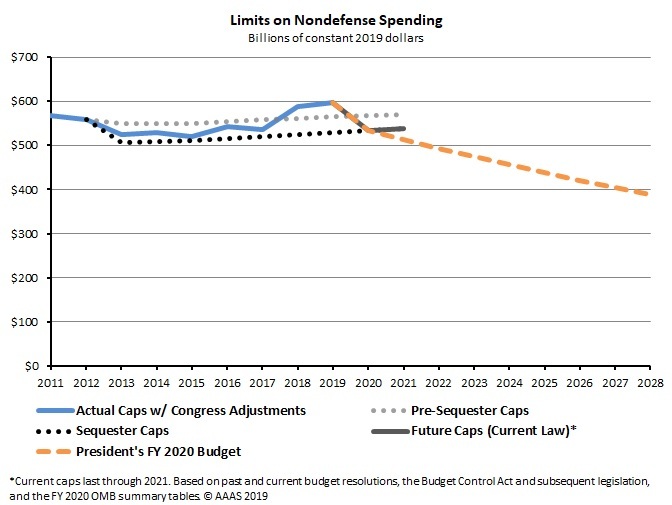 The Trump Administration would simply allow the nondefense spending drop to happen this year, while recommending deeper cuts in future years (see graph below). Meanwhile, the Administration would add substantial funding for defense programs (mostly for non-research activities), circumventing the caps in the process. This is a familiar tack for this Administration. The National Institutes of Health would receive, depending on the source, $33 billion according to the White House, or $34.4 billion per the Department of Health and Human Services. Either way NIH is looking at a decrease of at least 12 percent below FY 2019 levels. Within this tough context, the budget pledges a billion-dollar investment in opioids research, elevated funding for NIH facilities modernization, and a multiyear initiative on children's cancer research with $50 million in the first year. NIH's Next Generation Researchers Initiative would receive $100 million. The Administration also replicates a proposal from past years to consolidate the Agency for Healthcare Research and Quality within NIH, re-named as the National Institute for Research on Safety and Quality. That proposal has been shot down by Congress twice before. Within the Department of Energy, the Office of Science -- DOE's basic research funder -- would receive $5.5 billion, a roughly 16.5 percent cut from FY 2019. The cuts would likely run even deeper for most programs, however, because the Trump Administration would double funding for the Exascale Computing Project to $500 million, and increase Quantum Information Science funding to $169 million. Excluding these boosts, other programs within the Office of Science would receive a collective 23 percent reduction. The budget also includes $71 million for artificial intelligence and machine learning, $25 million to “enhance materials and chemistry foundational research” for industrial microelectronics, while reducing available funding for the Deep Underground Neutrino Experiment and the Facility for Rare Isotope Beams. On the applied front, the budget again reduces R&D on efficiency and renewables by over 70 percent and again eliminates the Advanced Research Projects Agency-Energy. Nuclear and fossil energy R&D programs would be subject to smaller reductions on the order of 20 to 40 percent below FY 2019 levels. The request provides sizable boosts of 30 percent or more for the new Versatile Fast Test Reactor and the department's new cybersecurity office, and establishes multi-million dollar initiatives in energy storage and materials manufacturing. The new Department of Defense budget would reduce basic science funding by $208 million or 8.2 percent to $2.3 billion. Overall DOD science and technology funding, including applied research and prototyping, would decline by $916 million or 10.7 percent. Within this context, the Defense Advanced Research Projects Agency (DARPA) would receive a 3.8 percent increase to $3.6 billion, while all three military branches would otherwise experience research reductions. DOD budget documents indicate the department would make a $9.6 billion investment in cybersecurity under the budget request, including a new $5 million collaborative basic science initiative. Within the Commerce Department, the National Institute of Standards and Technology would receive a roughly 30 percent cut, and the Manufacturing Extension Partnership is once again slated for elimination, as is the National Oceanic and Atmospheric Administration's Sea Grant university program. Both of these have been rescued by Congress for two years running. While NASA is often touted by the Trump Administration, the agency would see an overall cut of 2.2 percent below FY 2019 omnibus levels, down to $21 billion. Within that context, the Planetary Science program would receive a roughly six percent cut, with Europa Mission funding down to $600 million versus $740 million provided in the omnibus. Earth Science funding would be subject to an overall 7.8 percent reduction, with two missions – PACE and CLARREO Pathfinder – slated for elimination again. In another repeat from last year, the Administration proposes to eliminate funding for WFIRST, citing its significant cost and higher priorities within NASA, including the need to complete the James Webb Space Telescope. NASA’s Exploration Technology account received a large 9.4 percent boost, with funding for a new Lunar Surface Innovation Initiative that aims to spur creation of novel technologies needed for exploration on the moon. Meanwhile, the recently established Commercial LEO Development account would grow from the FY 2019 enacted level of $40 million to $150 million in FY 2020. Elsewhere, NASA's education office was targeted for elimination for the third year in a row. Other details are emerging on the NASA website. The National Science Foundation would be cut by roughly 12 percent to $7.1 billion. USDA's competitive grants program, the Agriculture and Food Research Initiative, would receive a surprisingly large 20 percent boost above FY 2019 to $500 million total, and the department would also establish a $50 million competitive program to modernize land grant university research facilities. On the other hand, non-facilities funding for the Agricultural Research Service would decline by roughly 12 percent, and other USDA research programs would also see reductions. EPA Science & Technology (S&T) would be cut by $243 million or 34.5 percent below FY19 enacted levels. All major S&T programs, with the exception of Homeland Security, would be subject to reductions of at least 30 percent below FY 2019 enacted levels. Notably, the agency’s Air and Energy research program would see a large 67 percent decrease, echoing last year’s proposal. The budget again proposes to eliminate EPA’s roughly $19 million contribution to the Global Change Research Program, a multiagency effort to better understand climate change impacts and adaptation responses. Far more details will be available in the coming days and weeks. But as always for presidential budgets, the bottom-line question is: will this matter to Congress? Previous Trump Administration budget recommendations have not, as Congress has generally ignored them and instead provided plus-ups for R&D. 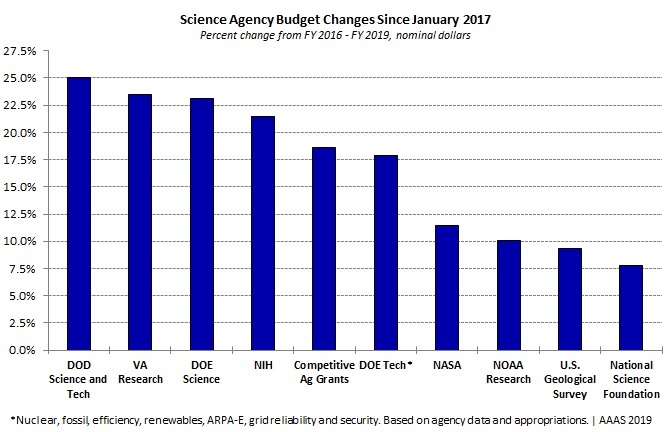 This notably included an historically large increase in FY 2018, but science agencies have fared well in other years as well (see graph below). Democrats have already denounced the current White House budget as expected, while the Republican response has been positive in some quarters but muted in others. Prior to this week's budget release, legislators were striking positive public notes, in a bipartisan fashion, on NIH, and other agencies have their supporters as well. Going forward, the other bottom-line question is, can Congress reach a deal to raise the spending caps? It will likely take time and much gnashing of teeth, especially as the question of border wall funding also remains unresolved and the debt ceiling looms. But with Democrats in control of the House and defense hawks ramping up their push for Pentagon dollars, there will be plenty of pressure to reach a deal and avoid these cuts.